Eric Cantor Planning to Bankrupt Virginia’s Republican Party to Regain Control | Virginia Right! The most damaging quote ever attributed to Ronald Reagan was his eleventh commandment: “Thou shalt not speak ill of any Republican.” Only Reagan did not coin the phrase. It was, in fact the California State Republican Party chairman Gaylord B. Parkinson who uttered those words as Reagan was being accused of being a Communist. Those words were later spoken by Reagan and are still used today to prevent criticism of elected Republican officials and keep the GOP worker drones in line. And those words are the reason we have seen so much bad legislation passed by Republicans. That phrase is like a Cross to a vampire. But there is one problem. People like me that don’t give a damn about calling out bad behavior no matter what party someone happens to be in. From tax hikes in Virginia to trillions in debt in Washington, that phrase has served the Republican establishment well in passing their Progressive Agenda and keeping themselves in power. And it is probably used more in the 7th District in Virginia than anywhere else. Because the worst offender is our own Eric Cantor. As Cantor moved from Public Service to self serving, the damage this man has done, aided by the 11th Commandment proselytizers, is second to none. He has personally signed the check for $14 Trillion of the nearly $18 Trillion debt. And despite his oft passed bills to repeal Obamacare, he has made no progress in 4 years. And now he wants to push amnesty. But Cantor’s defeat in Henrico on Monday is a powerful sign that his days in Congress are numbered. And make no mistake about it. Cantor has gone to war with his own party. Conservatives have taken over the Republican Party in Virginia. There are 83 seats on the Republican Central Committee and 53 of them are in Conservative hands. And with the election of Russ Moulton as Chairman at the meeting, Conservative Republicans can take heart that the Party is on the way to returning to the Republican Creed and restoring a Constitutional government. And Eric Cantor can feel his grip on the throats of Virginia and the nation loosen as his fingers are pried away one by one. So Eric Cantor has been doing what any self serving career politician would do. Cheating by “slating” votes, a scheme he knows now could very well backfire on him. Conservatives could have easily “slated” the Delegates in Henrico, locking Cantor delegates out. But they didn’t. And wouldn’t. And Cantor has met with the big Wall Street money men and twisted their arms to get them to stop funding the Virginia Republican Party. Cantor plans to push the Party to the brink of financial ruin with the help of his big money donors in hopes of swooping in as the Congressman of Hope and Change. And next weekend Eric Cantor is flying down to Amelia Island to meet with a group that is funded by Unions and George Soros – the big Obama money man – and a host of other left wingers to plot the destruction of the conservative movement. What we proved Monday in Henrico is that there is one thing that can overcome the money Cantor plans to spend to silence his critics. And that is grassroots activism. And that type of activism was on display in all it’s glory in Henrico. And I don’t know about you, but for the first time in a long time, I am feeling good about the direction of the Republican Party. If we can complete the job of returning the party to it’s roots, it’s Conservative roots, we can start to win elections again. The people like Cantor that worked so hard to defeat the Conservative ticket in Virginia last year are on the way out. They are not going to go down without a fight, that is for sure. And as Cantor plots to spread lies – just like those told by Delegate’s Jimmie Massie and John O’Bannon before the Henrico meeting on Cantor’s behalf – we can expect trouble. But we are far from powerless and activism does not take much money. So these games are nothing new, but the counter measure is hard work at the grassroots level. Now I reached the point with the Hanover Republican Committee, where they worship and applaud people like Eric Cantor and Walter Stosch, that I was made to feel unwelcome. And when I resigned as Magisterial District Chairman, I planned to remain active in the Party, I was just tired of being abused by people like Cantor who demanded spreadsheets and personal information of everyone I recruited to work the polls. Frankly, I work for a living and have better ways to spend my time than providing data for Cantor. But when I was able to make the meetings, I found that they were working harder to purge members who missed 3 meetings than they were trying to recruit new members. And the final straw was when Reagan’s 11th Commandment was thrown in my face in an open meeting. I blog. And I tell it like it is. And that’s not about to stop. That was at least a year ago and nothing has changed in Hanover. I am still a Republican but I am not going to waste my money on a Committee that is working harder to get rid of people than grow the party. But I am encouraged by the victories we have had and will continue to have. And there are some great Conservative committees worth joining. And as I mentioned Monday after the Henrico meeting, I am careful where I give my money. But I believe that the Virginia Republican Party is about to rise from the ashes where the Cantor power brokers left it financially strapped and bleeding. And the Party I remember – the Conservative Republican Party of Ronald Reagan – will rise again. And no, the Hanover GOP will not be getting my membership dollars and effort until they decide to live up to the Republican Creed. But there are a lot of units that have elected Conservative leaders who are not afraid to tell the truth. But the Republican Party of Virginia is driven by the Central Committee and with 53 members out of the 83 that “get it”, so I’m in. 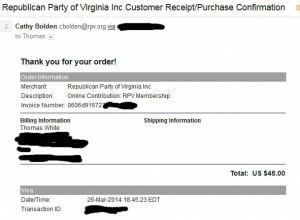 It has been a long time since I was not a paying member of the Republican Party. But my membership has usually been as a County Committee Member. And that was bothering me. And I believe it is time that Conservatives support the Republican Party of Virginia so that we can be a part of the Conservative rebirth. 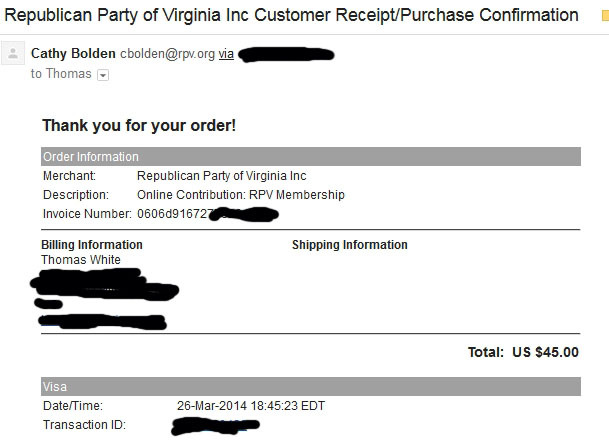 So I pulled out the Credit Card and visited the RPV and paid my $45 membership fee (receipt pictured – left). And like me, if your local committee is not worth the trouble, you can always go right to the RPV. And the fact that RPV Chairman Pat Mullins has come out against “slating” made it a lot easier to once again be a card carrying Virginia Republican. Cantor is doing a good job sending the party to it’s financial knees, but I believe there is more than a glimmer of life in the Old Party. And once we fend off the assault by those who want to harm the Republican Party like Eric Cantor and his George Soros buddies meeting at the Ritz, we can begin to win again. And the next person that tries to shove Reagan’s 11th down my throat best step back a couple of paces. I am not buying that line ever again. Nor should you! ← VICTOOOOOOOOOOOOOOORY! FINALLY ROANOKE COUNTY is OUT of ICLEI! TIME for a NEW ROUND of PRAIRIE FIRES and STARVE the ICLEI BEAST! Careful, Tom…we might just have to place Reverend in front of your name. I’m still probably going to hell. Snicker. Tom White recently posted…EARLY REPORTS SUGGEST FARAGE SCORES CLEAR WIN OVER CLEGG on the RADIO! Clearly, Canter and McCarthy are nervous. GR8 Stuff, my good and faithful servant! This is a winnable war, people are waking up! Tom, right on. Got my big boy pants on. I believe there is a big yellow sign in your words of wisdom. Thanks for all you do.